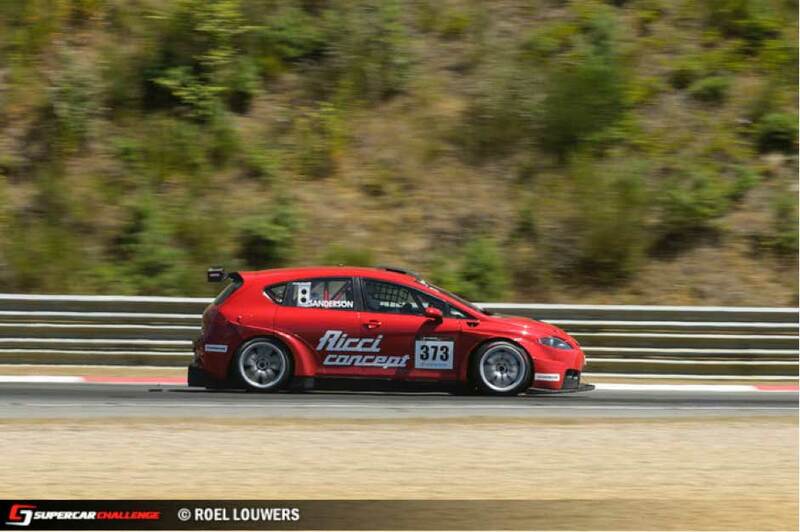 Nick Sanderson took his SEAT leon supercopa to Belgium to take part in the Dutch supercar challenge. This was a great experience to take the grid at the famous Belgium grand prix circuit. The grid consisted of a great selection of race cars from Porsche GT3, BMW silhouette, Leon cupra TCR and lotus. Located close to Pendine sands where many land speed record attempts have been made, Pembrey was one of Ayrton Senna’s favourite and many race teams test here due to the technical mix of slow and fast corners. The weather was set to be fabulous for the weekend and we were spoilt by the crowds who were treated to 3 races. All races took place on Sunday with Practice and qualifying taking place on Saturday using the new circuit layout. 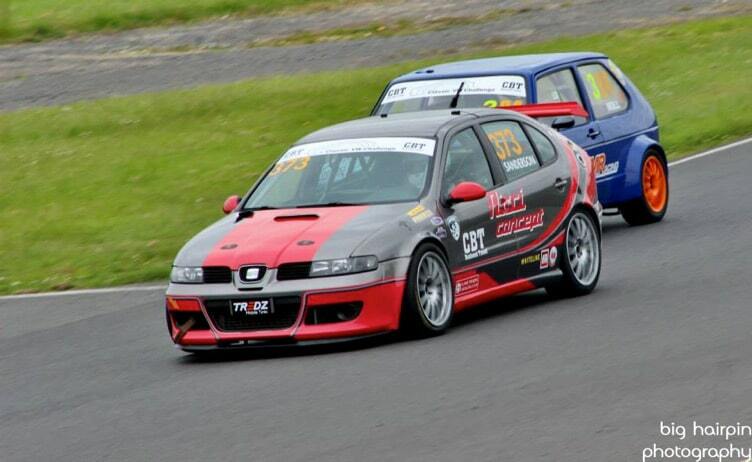 Qualifying 3rd meant the Seat Leon had a good grid position into turn 1 for the 1st race. Race 2 finished with the same result as race 1, but after a crash at the first corner hair pin between Mark Shepherd’s vw Golf and Peter Kaylor’s seat Leon which held the pack up allowing the VW Corrado a slight lead from start to finish. Race 3 was a different affair as Nick Sanderson in the Ricci concept Seat Leon supercopa had a great start, pushing Ken Lark’s Corrado until on lap 3 he had gearbox problems and pulled off, leaving the seat to take the lead closely followed by the Vento of Alex Kite. The lead change hands on lap 6 as Nick Sanderson ran wide giving away position to the Vento and the lead. Desperate to take the lead back The Seat Leon took a daring late brake manover into the 1st corner hairpin to take the lead back. A close battle ensued as spectators watched on between the Seat Leon and vw Vento with Nick Sanderson taking the chequered Flag and the end to a great weekends racing. 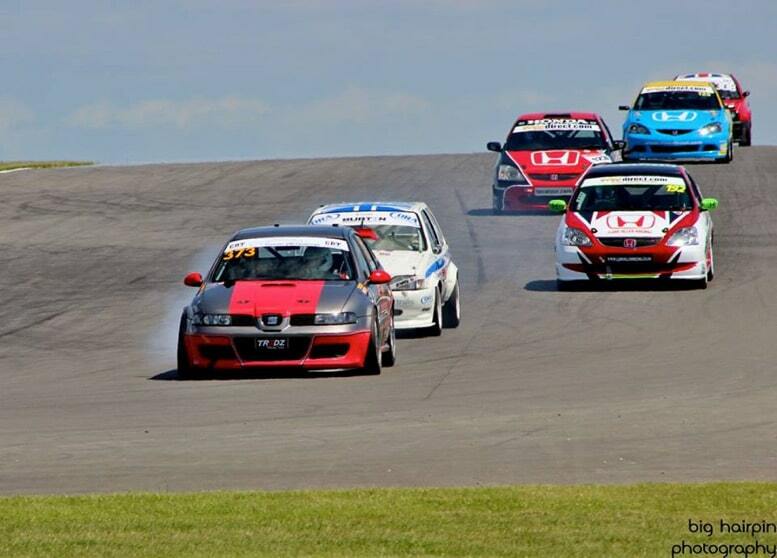 The season finale of the 2015 classic vw challenge end at the fastest circuit in the uk…. Thruxton. 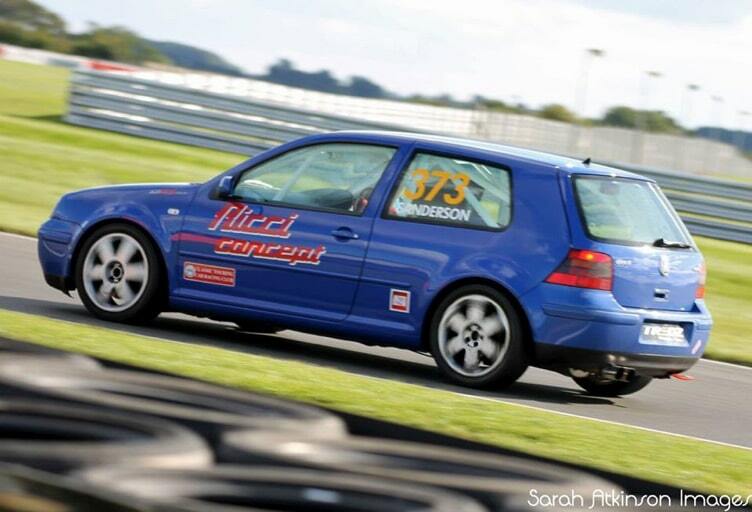 This was a new circuit to us and with the golf not showing good results at Snetterton this was the final chance of the season to improve the VW Golf before the winter break. The Weather was dry and with a circuit walk the day before and 2 other qualifying sessions before it all looked promising. Qualifying was a busy affair with 35 cars on circuit. Nick was having a hard time with the car as handling and braking problems were leading to poor lap times resulting in a disappointing 32nd out of 35 cars. Drastic changes were made including brake pad compound change and we would see what that brought. Great start with more to come..
Race 2 Starting mid grid allowed Nick to make more progress towards The front. With the track still dry The VW Golf immediately made more progress carving through the cars ahead passing a grand total of 10 more cars finishing the season on a high in 14th place with the owner of the golf very pleased with the progress of the car thanks to the engineers at Ricci concept. Snetterton brought a new challenge for us as we were asked by a customer to develop his race car which had never raced in anger! The weekend would be interesting to say the least making small adjustments to improve the cars handling but inevitably the weekend would fall wanting with braking problems and a lack of track time in the car. Qualifying was an exciting one with many drivers having not race at the circuit before and testing ditterent settings and lines. The Seat Leon eventually qualifying 5th for race 1. Very good for a new circuit. Race 1 Started with a very fast pace with cars jossling for position over the 1st lap, but distaster struck on the second lap after Len Simpson failed to stop going into the hairpin on the second lap causing damage to the seat leon and stuart mcmaster’s honda accord which caused the red flags to come out as the cars were removed and the grid reformed for the restart. Nick nursed the damaged seat leon back to the pits for running repairs and started at the back of the grid. As the race started nick fought through the field eventually fighting back to the front and challenging the vw corrado of Ken Lark for 2nd before a damaged boost hose failed causing retirement. Race 2- The seat leon started from the back with a group of other cars which failed to finish the 1st race for one reason or another. 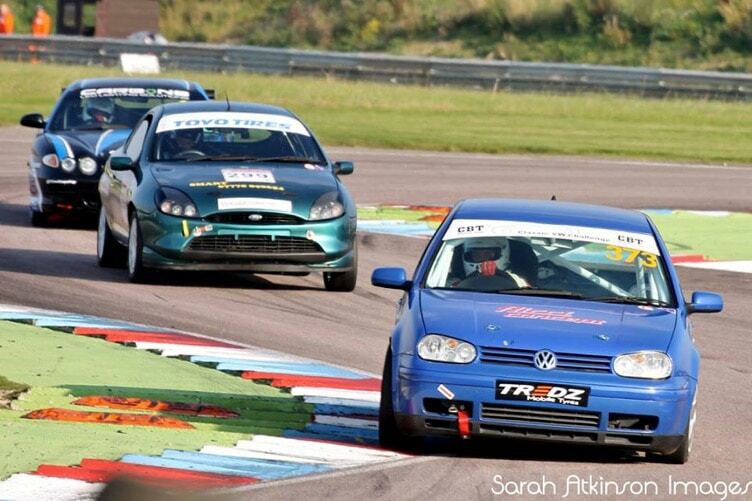 this race followed the 1st in style with the leon eventually finishing 11th. A damp circuit greeted the classic VW challenge for qualifying as they were 1st out on the Indy circuit. Unfortunately qualifying was short as a coil failure only allowed the seat Leon to complete 6 laps dropping Nick Sanderson down to 17th position. Race 2 started with Nick taking position 20 on row 10 of the grid. As they pulled away for the green lap the heavens opened up with torrential rain which would play to the Seat Leon’s advantage. The lights went out and the grid raced away admittedly at a cautious pace and the Leon slowly cut through the grid lap after lap as the rain pounded down on the track before eventually running out of time as the chequered flag dropped finishing in a respectable 9th place after making up 11 places over the course of the 15 minute race. On the weekend of the 6/7 June Donington Grand prix circuit hosted the CBT VW Challenge sharing the weekend with the British super kart grand prix. With the weekend turning out to be a mini heatwave and good crowd numbers all weekend, the racing did not disappoint. Race 1 continued the excitement as a poor start from the 1st row of the grid left the Seat Leon on Nick Sanderson 2nd into the 1st corner and fighting hard down through Hollywood and Craner curves for 1st place. As the race panned out positions changed many times before eventually finishing where he started in 4th place for the second race. Determined to do better in race 2. Race 2 started well as Andy Thompson lead into the 1st corner in his Seat Toledo followed closely by Olly Allen’s Fiesta and Nick in the Ricci Concept Seat Leon. Lap after lap passed as the 4 cars closed up on each other, then on lap 4 the Honda integra of Jim Mcgloughlin slowed and pulled to the side of the track putting the Seat Leon in a podium 3rd place as the chequerd flag dropped. 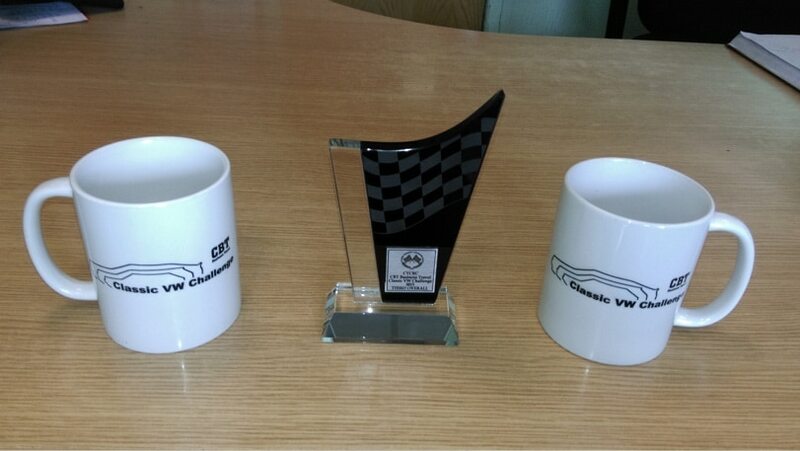 A great end to the weekend and a 1st podium finish for the Ricci Concept Seat leon of the season. 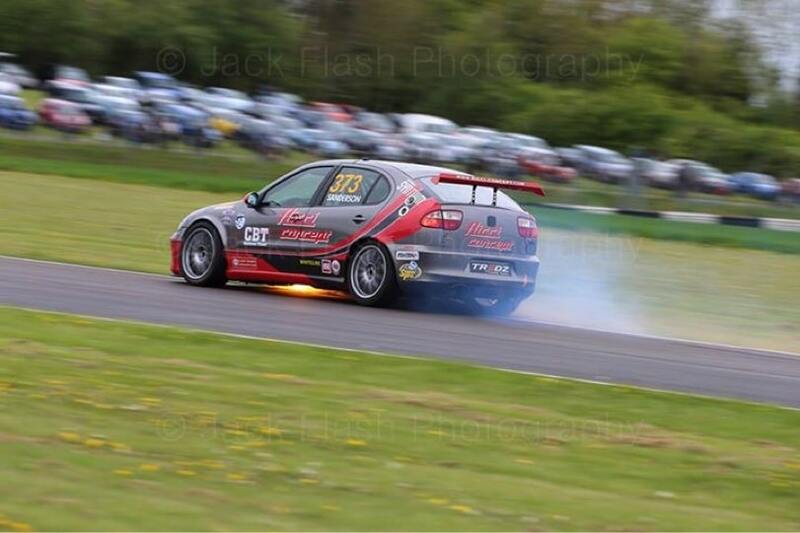 As the championship moves to round 3 on the weekend of 23/24 may we arrived at Mallory Park in Leicestershire. This is a new track to us and with no testing, qualifying would be a steep learning curve with the circuit only being a short circuit with sub 1 minute lap times and average speeds over 90 mph! Qualifying proved eventful as we learned the track eventually finishing 9th overall for the 1st race. With a downpour before race 1 many cars started on wet tyres with only Steve wood in his VW golf starting on slicks but on pole. As the race went on the slicks turned out to be the better long term choice as the track dried over the race distance, but the Seat Leon of Nick Sanderson got used to the track he started to move slowly up the grid eventually finishing 6th . A good position for race 2 and 3rd in class. Race 2 was dry and late in the day so everyone was on Slick tyres. The race started well as The Seat Leon headed into the first corner, picking his way through the front cars and eventually up to 3rd place. Then late into the race chased closely by Andy Thompson in his SEAT Toledo touring car, Nick missed a gear going into the Shaw’s hairpin which gave the Toledo the run on him through the devil’s elbow and down onto the start finish straight. Later as the chequered flag dropped that was the way the race finished with the SEAT Leon in 4th place overall behind the Toledo. Great weekends racing. 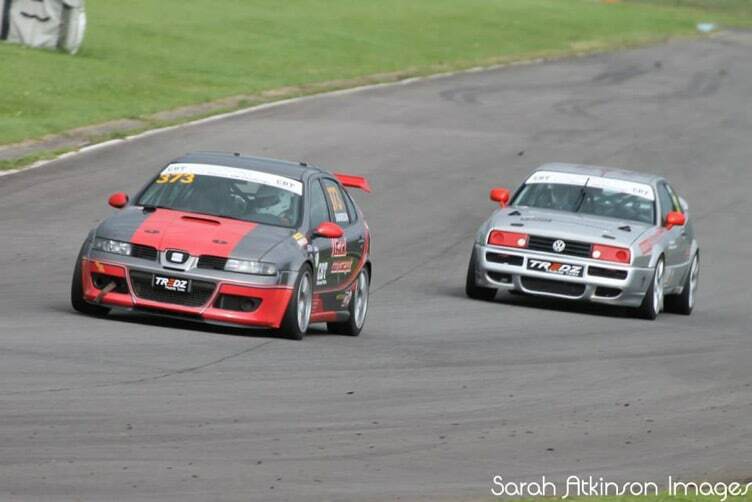 The Castle Combe race on bank holiday Monday the 4th may brought mixed results as poor qualifying positioned the seat leon mid grid in 14th place for the 1st race. The 1st race did not fare much better as Nick Sanderson had a poor start loosing places but battling strongly to re gain the places by the end of the race. Race 2 was covered live on Motors TV started much better as the car performed well and a good start saw Nick gain places and charge through the pack eventually reaching 7th place towards the end of the race before engine failure forced retirement. The 2015 season starts with a bang as the Ricci concept seat Leon takes 3rd place in the 1st and 2nd races of the season at Silverstone national circuit. With a dry qualifying, which turned to a changing/ wet track for races 1 and 2 Nick Sanderson drove well with stiff competition from a mixed grid shared with Burton Power Blue Oval Saloons and VTEC Direct Pre 03 Production Touring Cars to cement 2 great results for the start of the season finishing 3rd in class and 6th overall in race 1. Fondly nicknamed the ‘mini Nürburgring’, Cadwell Park celebrates its 80th anniversary in 2014. It remains as held closely in the hearts of many motorsport fans as ever. Located 10 miles north of Horncastle and five miles south of Louth, the Lincolnshire circuit is especially popular with racers nationwide. Nick Sanderson Records his best result of the season so far with a double 4th place just missing out on the podium after start line accident removes 3 cars from the restart in race 1. Race 2 started poorly being held up on the start. As the race unfolded Nick Sanderson in the Seat Leon chased down the leading pack only to enter into a hard fight over the last laps with Richard Morgan in his VW Golf 5 eventually finishing 4th. Great racing was enjoyed by all especially the local crowd who came to watch. 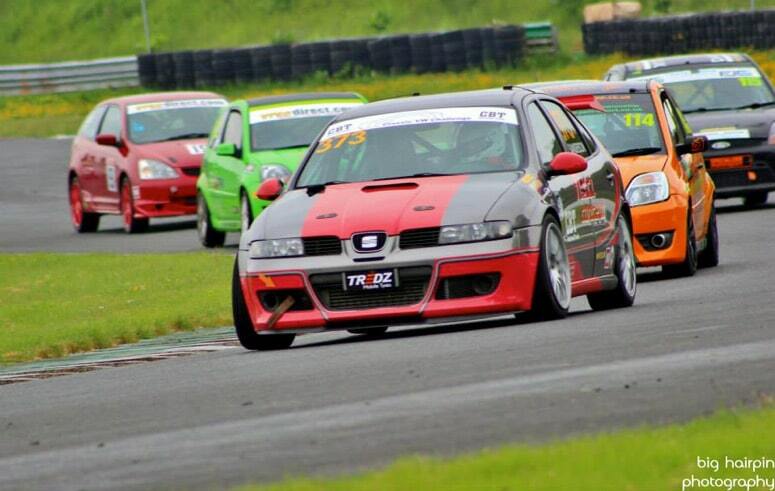 clean lap was well nigh impossible.The seat leon of Nick Sanderson qualified 12 back on the 6th row of the grid. The Ricci Concept Seat leon progressed throught the field eventually finishing 10th for race 2. Race 2 started much dryer which made the race much closer. Nick battled through the field much the same as the 1st race with the only drama, a full spin coming out of gracelands which dropped him back 2 places. These were recovers quickly finishing the race a respectable 7th close behind the vw beetle of martyn culley. The new 2014 race season gets under way for the VAG Trophy and now Confirms ‘Dunlop’ as the Title sponsor and tyre supplier. Ricci concept prepares for the 1st round at the famous Silverstone GP circuit. Rounds seven and eight of this year’s SuperPro VAG Trophy marked an historical moment in the history of the championship, as it was the first time in its five-year history that an event has taken place outside the UK. 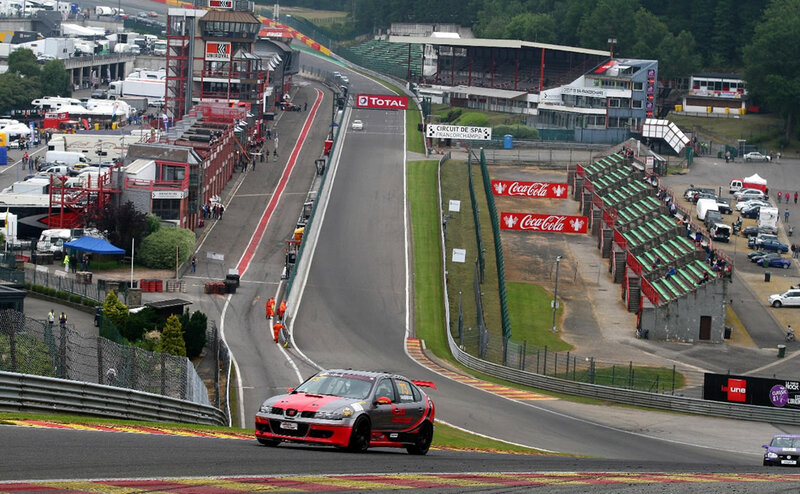 The venue chosen by the organisers for the championship’s first overseas foray was the infamous Spa Grand Prix circuit. Steeped in history, its topography and character are the subject of legends and, for drivers, it poses a challenge unlike any other track. After a weekend of dramatic competition, it was Stewart Lines that claimed victory in both rounds, taking his Mk5 Golf GTI across the line in the first race ahead of Dave Carvell in his VW Scirocco and Josh Caygill in his Mk5 Golf in the second. The action started on Thursday with a free practice session during the afternoon. Then, that evening, adding to the atmosphere of the occasion the event organisers arranged for all competing cars to be led in convoy to the nearby town of Stavelot, where they were parked on display in the central square. Qualifying took place on Friday morning and, with drivers still familiarising themselves with the seven-kilometer circuit, it was perhaps inevitable that lap times reduced as the session went on. The Seat leon of Nick Sanderson performed well in practice and qualified 11th overall. Race one was not without incident as on the 1st lap Nick was tagged from behind and just kept the car out of the barrier. This spurred him on to pass many cars as he caught up the lost places finishing in 9th place race 2 was just as competitive and the seat battled throughout the race to finish a respectful 9th in there 1st season at this iconic track.